After a large heist, the team (Popeye, Pepsi, Yenicall, Zampano, and Chewing Gum) goes to Macao for another job. That job is offered by the mastermind, Macao Park, Popeye’s old partner. The group also have to work together with the Chinese team. Their mission is to still ‘Tear of the Sun’, a 318 carat diamond worth over $20 million held at the Macao Casino. While working together, all of them have their own agenda to steal this diamond. Also, some of their pasts get in their way in the present. 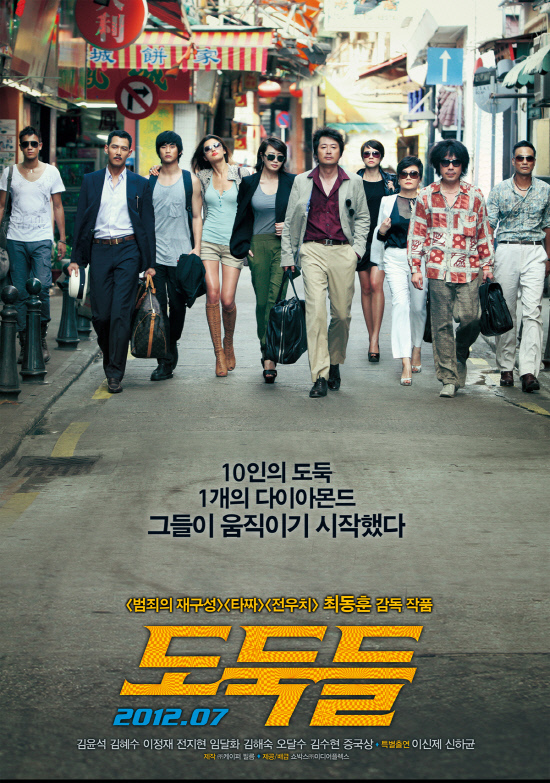 When I watched the trailer, my first impression is that this film is like the Hollywood film, ‘Ocean’s Twelve’. Yes, there is a slight similarity between them but there are sparks to ‘The Thieves’. I enjoyed it. There are a lot of interesting casts which I admired a lot. Each character has different personality and you can instantly pick which one is your favourite thief. At the first half of the film, I was basically slightly moving a bit in my seat. Why? Because it was hilarious. It’s the magical words and actions that make us laugh and cringe in a good way. There are so many of them that make us laugh. I also love how they use their skills and abilities to steal the diamond. This truly adds the flavour in this film. My favourite couple is Yenicall and Zampano because of their interesting conversation and the scenes that make me laugh such as the gay scene between Zampano and the Chinese guy. I cringe a bit but, at the same time, I enjoyed it. Yenicall and Pepsi are my favourite female characters. Jeon Ji Hyun has her way with words that are laughable and makes sense. Whatever she does to cover up her mistakes, she does the funniest and unexpected things that make me laugh so loud. I give thumbs up for Kim Hye Soo for portraying the cool and sensitive character of Pepsi. She was able to show that she knows what she’s doing while still having feelings for Macao Park. Kim Yoon Suk has seriously pulled off well in being Macao Park from coolness to action. He is able to show who’s boss and what are the actions that he’s going to do. Also, I’m impressed that he can speak Mandarin fluently. It was worth the practice to speak fluently which I understand what he’s saying. 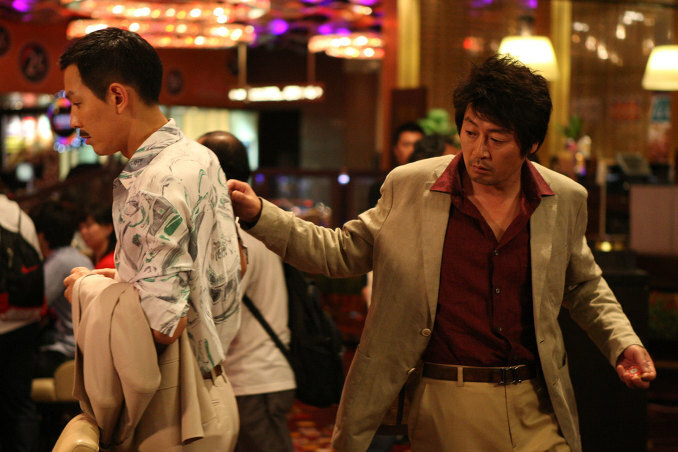 However, at the second half of the film, I lost touch with it because almost half of the main casts have left such as Chewing Gum and Chen died and Zampano is sent to jail. Also, it’s because there is a lack of strong connection between Macao Park and Pepsi. I wish they could do more on that. Simon Yam and Kim Soo Hyun did awesomely well at the first part of the film but I wish that they could stay longer until the very end of the film. Besides that, the kissing scene between Popeye and Pepsi was not that good. I know that Pepsi tries to stop Popeye from kissing but it wasn’t that impressive in showing a forceful kiss in the rain. I’m a bit disappointed about that. Also, the slow motion camera when Chewing Gum and Chen got themselves in a car accident, not impressed with that even though their love has just started to blossom. I’m even more disappointed with Wei Hong. I expected to be the rough gangster leader but he turned out to be the little man in a suit while holding the gun to shoot because he wants his way to happen. So, between those two halves, I prefer the first one because there are lots of action and laughter. Overall, the settings are amazing that we are brought to various places from Seoul to Hong Kong to Macau and then to Busan. These are the places which I hoped to see when it comes to making a thief caper film. After having the right places and going through film regulations, they manage to show us some action in this film. The action scenes open my eyes and wondering what’s going on which I really enjoyed. I love the amazing casts in this film but I wished the half of the casts like Kim Soo Hyun and Simon Yam could stay on till the very end because they could have done more than that. There are some actions and comedic scenes that I love but there are some that need some fixing. So, this film will make you laugh and connect with the thieves who are in action but there are a few bits that should be considered. The laughter and action made me enjoyed this film a lot that I moved within my seat from time to time. I hoped that Director Choi would come up with the sequel because the ending makes me think that something is going to happen next. If that were to happen, how the sequel will be?